A SpaceX Falcon 9 rocket with a reused first stage launches the SES-10 communications satellite into orbit from Florida’s Cape Canaveral Air Force Station on March 30, 2017. The SpaceX rocket that made history last week by flying its second orbital mission launched on its first jaunt one year ago today. 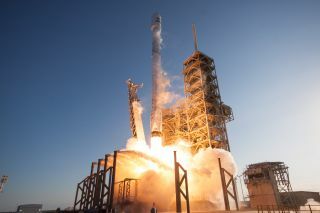 On April 8, 2016, a SpaceX Falcon 9 booster launched the company's uncrewed Dragon capsule on a resupply mission to the International Space Station for NASA. About 8 minutes after liftoff, the rocket's first stage came down for the company's first-ever landing on a "drone ship" in the ocean and its second successful touchdown overall during an orbital mission. The March 30 mission marked a big milestone for SpaceX, whose billionaire founder and CEO Elon Musk has prioritized developing fully and rapidly reusable rockets as a way to slash the cost of spaceflight. Before the SES-10 flight, the company had landed eight Falcon 9 first stages during orbital missions, but it had never re-flown one. Eventually, SpaceX aims to launch and land each Falcon 9 first stage many times. The booster is designed to fly 10 times with no hardware changes and at least 100 times with only moderate refurbishment, Musk said March 30 during a postlaunch teleconference with reporters. But the newly landed booster won't achieve such levels of reuse; its flying days are done, according to Musk. "We think this one has some historic value, so we are thinking the Cape might like to have it as something to remember the moment," he said in the March 30 teleconference, referring to Florida's Cape Canaveral, the launch site for SES-10 (and many other missions as well; the Cape hosts NASA's Kennedy Space Center and Cape Canaveral Air Force Station). "We are going to present it as a gift to the Cape," Musk added. SpaceX did something similar with the first-ever Falcon 9 first stage that landed successfully. That booster — which came down on terra firma at Cape Canaveral during the successful launch of 11 communications satellites on Dec. 21, 2015 — now stands outside SpaceX's headquarters in Hawthorne, California.